The main difference between these two processes is that evaporation involves a change in the state of matter while distillation is a process of separation. Both processes are important in its context. However, both the processes are used for various reasons. Evaporation is a natural process whereas distillation is a process that is usually initiated by an outside force. Evaporation can happen within the process of distillation however distillation cannot take place within the process of evaporation. Evaporation is actually a process wherein liquid changes a state, into gas. The term “evaporation” is used specifically when the vaporization of the liquid happens from the surface of it. A lot of factors can affect the process of evaporation such as the surface area, pressure, density and temperature of the substance, the concentration of other present substances, etc. Distillation, on the other hand, is a method used to physically separate the compounds from certain mixtures. This process is based upon the boiling points of the different components in the mixture that are being separated. On having a mixture that contains components with different boiling points, the water evaporates or changes into vapor at different times on being heated. So as you can see, evaporation actually does happen within the whole process of distillation. This article talks about everything there is to know about both processes. To be able to understand them completely, you have to each of the processes individually. From the definition of the actual processes to all other pertinent information, you will see that these two processes are really very different and unique. What makes Evaporation different from Distillation? To be able to see how different these two processes are, first, we must define these two terms. Evaporation and distillation vary from how they actually work. Though both processes are scientific in nature, they vary from what they are to what they are for. Let’s look at the definitions of these two processes below. Converting the state of water into the gaseous state without putting it under boiling is known as process of evaporation. It is a fact that the molecules of liquid contain molecular bonds. On providing enough energy of heat, these bonds loosen up. As a result, the molecules are released into the gaseous phase. 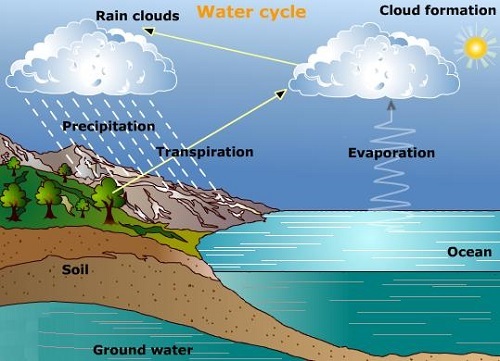 The process of evaporation takes place at the water-surface. This is due to the fact that the surface is quite closer to the atmosphere. Because of this, heat can easily be absorbed. Typically, evaporation occurs before the liquid reaches to its boiling point. The only liquid molecules that break their intermolecular bonds are the ones which are closer to the liquid’s surface. Then they are converted into gas. The other molecules which are found in the liquid easily evaporate when they reach the surface. At this time, such molecule exposes itself to the atmosphere. The strength of the all the molecular bonds between the molecules of liquid determine the rate of the evaporation process. On finding the strong intermolecular bonds the liquid evaporates at a slower pace. However if the intermolecular bonds of the liquid are weak, then the liquid is highly volatile. The main reason behind slow evaporation of water is strength within the hydrogen molecules. However, organic compounds which are non-polar won’t have these kinds of strong intermolecular attractions. Such molecules are known as Van Der Waals bonds and these are weaker by nature. So that means that the molecules of the liquid can go into the vapor phase easily. In contrast to distillation the process of evaporation takes place at a slower pace. The rate of the process depends mainly on the surface area of the liquid and the rate of the air flow. When both are high, then the rate of the process of evaporation increases automatically. Unlike evaporation, which is a natural occurring process, distillation is man-made and a modernized process. It is a technique of separating purest liquid forms from other liquids. It is based on varied boiling points of the different liquids. It occurs because of the varied strengths of the different intermolecular forces found in substances. Since different kinds of liquids have different boiling points, then the heat energy is needed to break the bonds differ as well. Distillation is basically used to separate combinations or mixtures of liquids. It is a process which involves boiling and condensing the liquids. The liquid is heated and boiled until it reaches its boiling point. Then the temperature is maintained until the significant liquid completely vaporizes. When that happens, then the vapor is turned back into the liquid phase by using a condenser. This technique is used to separate liquids with a boiling point gap which is significant. The elements of the mixture are separated when the liquids boil at their own specific boiling points, changing into vapor. The vapor is then condensed and gathered. With this technique, two miscible liquids are separated using a fractionating column. These two liquids typically have boiling points which are close to each other. Finally, with this technique, elements which are immiscible with water are separated using steam. When these elements are mixed with the steam, they would vaporize and a significantly lower temperature, instead of at their normal boiling point. Evaporation is the process of changing a liquid into gas. This is done by applying heat to the liquid so the molecules at the surface easily changes into vapor. Distillation, on the other hand, is a process which is made up of acquiring vapor or gas from liquids. This is done by heating the liquids to get the gas then condensing the relevant gas to liquid products for different purposes. The process of evaporation only happens at the surface of the liquid whereas the process of distillation doesn’t only happen at the surface of liquids. In the process of evaporation, the liquid vaporizes below its boiling point on the contrary in distillation process; the liquid vaporizes at its boiling point. The process of evaporation is a slow and gradual whereas on the other hand, the distillation process is quick or rapid. Evaporation isn’t a technique for separation. It’s actually a process where a liquid changes its state of matter to gas. So it’s a change in the state of matter. 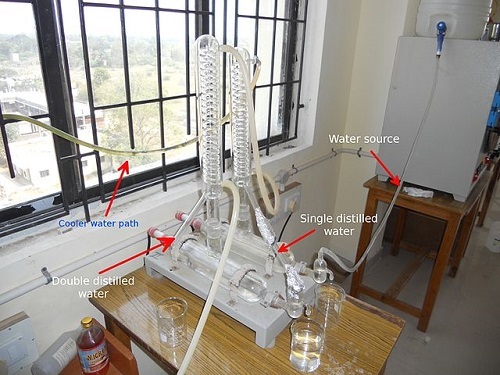 On the other hand, distillation is a technique for separation which is used to collect a significant liquid from a mixture of liquids. In the process of distillation, when the liquid reaches the boiling point, the liquid forms bubbles. However in the process of evaporation, the bubbles don’t form any bubbles as the liquid doesn’t reach the boiling point. Distillation is a process used for separation and purification of a liquid. However, evaporation isn’t necessarily so. In the process of distillation, heat energy needs to be supplied to the molecules of liquid. This is so that the liquid molecules will go into the vapor state. However in evaporation, external heat energy doesn’t need to be supplied. Instead, the molecules get energized when they collide into each other during the process. That energy is then used to release the molecules into the vapor state. Evaporation can be a natural process while distillation is a process which was invented / created. It takes place in a laboratory using a apparatus. When thinking about the basic elements of the universe, you will definitely be thinking about the matter. It is all around us, found in three different phases – solid, liquid and gas. Substances can change their physical states between these three phases. It’s a phenomenon which is called a “phase change,” and it can happen at different temperatures. Evaporation happens when there is enough heat energy to break down the intermolecular attractions in liquids. When this happens, the liquid molecules are released into a gaseous phase. The boiling of a specific substance happens at a specific temperature. When this happens, the vapor pressure which is exerted by the substance in the gaseous phase becomes equal to the pressure of the atmosphere. This phenomenon is the basis for the process of distillation. So, the bottom line is that the main difference between evaporation and distillation is at the boiling point. The process of evaporation happens below the boiling point of a liquid while distillation happens right at the boiling point. There are other differences between the two processes since they are not really alike. They do depend on certain factors which may be similar but all in all, they are vastly different. Simy Em. "The Difference between Evaporation and Distillation." DifferenceBetween.net. August 14, 2017 < http://www.differencebetween.net/science/the-difference-between-evaporation-and-distillation/ >.